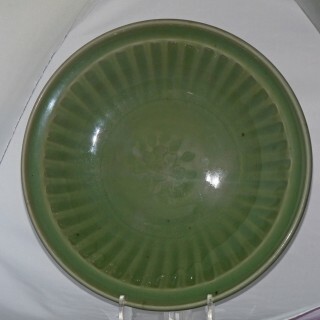 Ming late 15th Century Longquan celadon carved saucer plate with deep glaze of an excellent colour. 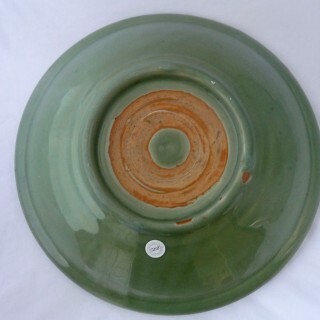 The deep green glaze covers the deep fluted ribs of the inside around the base and to the base itself an impressed or carved lotus flower. As with all celadon of this age there is a cleared off ring to the underside base. where the glaze has been cleared away it exposes a ruddy / orange colour. 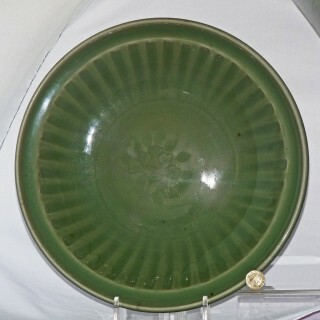 the outside of the plate is undecorated allowing the glaze to fall down the sides and around the foot rim. the unglazed area is where the plate was supported in the kiln so preventing it from firing on to the kiln shelf or surface.